Carpenter grew up in Seaside, Oregon and attended his local Seaside High School. After graduating, he enrolled at Oregon State University in Corvallis, Oregon. 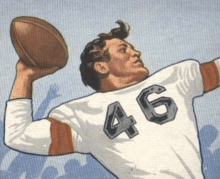 He played as a halfback for the Oregon State Beavers football team between 1946 and 1949. Oregon State finished with a 7–1–1 win–loss–tie record in his freshman year under head coach Lon Stiner and played in the Pineapple Bowl after finishing 5–4–3 in 1948, his junior season. Carpenter rushed for 1,003 yards in 1949. It was the third-best total in the Pacific Coast Conference and the first time an Oregon State player had eclipsed 1,000 yards of rushing. Carpenter played in the annual East–West Shrine Game in January 1950 and the College All-Star Game, a now-defunct annual matchup between the National Football League (NFL) champion and a selection of the country's best college players. The Cleveland Browns of the NFL selected Carpenter in the first round of the 1950 draft, making him their first pick since joining the league after the dissolution of the old All-America Football Conference. Cleveland ended the regular season with a 10–2 record in Carpenter's rookie year and won the NFL championship. The team advanced to the championship game again the following year, but lost to the Los Angeles Rams. Carpenter had a strong season, rushing for 118 yards in a game against the Chicago Cardinals and ending the year with six touchdowns. Those performances, in addition to a touchdown run late in the championship game, helped earn him a spot in the Pro Bowl, football's all-star game. Two further championship-game losses followed in 1952 and 1953, both against the Detroit Lions. With the Browns, Carpenter played as a halfback opposite Dub Jones as part of an offense that featured quarterback Otto Graham, fullback Marion Motley and ends Mac Speedie and Dante Lavelli. He helped replenish Cleveland's backfield following the retirement of Edgar Jones, Bill Boedeker and Ara Parseghian after the 1949 season. Carpenter, who had been a second-string halfback to Ray Renfro in the 1953 season, decided to jump to the Canadian Football League (CFL) in 1954, signing with the Saskatchewan Roughriders that June. He was one of a number of NFL players who departed in the mid-1950s for Canada after player salaries declined and made playing in the CFL more attractive. In his first year in Saskatchewan, Carpenter scored nine touchdowns and had 1,068 combined rushing and receiving yards as a dual-threat end. He also led the division in kickoff returns, with a 39-yard average. The Roughriders finished the regular season with a 10–4–2 record for second place in the CFL's western division, then called the Western Interprovincial Football Union (WIFU). While the team made the playoffs, the Roughriders lost in a divisional semifinal. Carpenter had another strong season in 1955, when the Roughriders again finished in second place in the WIFU with a 10–6 record and again lost in the divisional semi-final. His 18 touchdowns for 90 points were set a WIFU record and won him the Dave Dryburgh Memorial Trophy, given to the west's top scorer. He was the only unanimous selection by sportswriters to the annual WIFU all-star team. He also won the Jeff Nicklin Memorial Trophy, given annually to the WIFU's most valuable player. Carpenter had the best season of his CFL career statistically in 1956, when he rushed for 727 yards, had 784 receiving yards and added 14 touchdowns. Saskatchewan posted a 10–6 record for the second season in a row and lost in a divisional final series. Carpenter was again named a WIFU all-star. Slowed by injury, Carpenter's production declined in the 1957 season. He was limited mostly to receiving the following year after the Roughriders acquired halfback Cookie Gilchrist, but he was nevertheless named a WIFU all-star again as an end. Carpenter's output fell in 1959 to 490 total yards, his final season as a player in Saskatchewan. The Roughriders named Carpenter their head coach after the 1959 season. The appointment was a surprise because of Carpenter's lack of coaching experience, but he got the job over Hamilton Tiger-Cats assistant Jack Jacobs and former Baylor University head coach George Sauer because of his familiarity with the team and his rivals' high salary demands. He was also recommended by his former Browns teammate Speedie, who had jumped to the CFL. Carpenter's one year of coaching in Saskatchewan was unsuccessful, however. The team won just two games, and Carpenter resigned in November, saying he was looking at a possible assistant coaching job with the Denver Broncos, a team in the new American Football League (AFL). Carpenter instead became an end for the Broncos for part of the 1960 season, catching 29 passes for 350 yards. Carpenter resumed his coaching career in 1962, taking a job as the head coach of the Indianapolis Warriors, a team in the United Football League. He spent most of the 1960s coaching in the UFL and CFL, a pair of smaller leagues that struggled to compete with the NFL and AFL. In 1968, however, he joined the NFL's Washington Redskins as an assistant coach after his former Browns teammate Otto Graham became head coach. He left that job the following year and was coach of the Jersey Tigers in the minor-league Atlantic Coast Football League for two seasons. Following his coaching career, Carpenter worked as the director of recreation for the Indiana Department of Correction. He was inducted into the Oregon Sports Hall of Fame in 1982 and into Oregon State's athletics hall of fame in 1991. Carpenter died in 2011. He had a son (Kenny) and a daughter (Kimberley)with his wife, Doris. 1 2 3 4 5 "Kenneth L. Carpenter". The Oregonian. February 3, 2011. Archived from the original on August 30, 2013. Retrieved August 30, 2013. 1 2 3 "Ken Carpenter – Football". Oregon Sports Hall of Fame and Museum. Archived from the original on August 30, 2013. Retrieved August 30, 2013. ↑ "Oregon State Yearly Results". College Football Data Warehouse. Archived from the original on August 30, 2013. Retrieved August 30, 2013. 1 2 "Ken Carpenter – Cleveland Browns". Trading Card Database. Archived from the original on August 31, 2013. Retrieved August 31, 2013. 1 2 3 4 Johnson, Hank (December 12, 1959). "Coaching Job To Carpenter". The Leader-Post. p. 22. Retrieved August 31, 2013. ↑ "1950 NFL Draft". Pro Football Reference. Archived from the original on August 30, 2013. Retrieved August 30, 2013. ↑ Piascik 2007, pp. 225, 228. ↑ Piascik 2007, pp. 228, 233. ↑ Piascik 2007, pp. 191–193, 199. 1 2 "Carpenter of Browns Gets Canadian Job". Cleveland Plain Dealer. Regina. Associated Press. June 13, 1954. p. 7–C. ↑ Piascik 2007, p. 268. 1 2 3 4 5 6 7 8 "Ken Carpenter". CFLapedia. Archived from the original on August 31, 2013. Retrieved August 31, 2013. 1 2 "The Saskatchewan Roughriders' 1954 Season". CFLDB. Archived from the original on August 31, 2013. Retrieved August 31, 2013. ↑ "The Saskatchewan Roughriders' 1955 Season". CFLDB. Archived from the original on August 31, 2013. Retrieved August 31, 2013. ↑ "Bombers' Casey Quits Football". Saskatoon Star-Phoenix. Winnipeg. Canadian Press. December 12, 1955. p. 16. Retrieved August 31, 2013. ↑ Vickery, Al (November 8, 1955). "Five Homebrews Crash All-Star Squad". Saskatoon Star-Phoenix. Winnipeg. Canadian Press. p. 14. Retrieved August 31, 2013. ↑ "Trophy Winner". The Leader-Post. December 9, 1955. p. 33. Retrieved August 31, 2013. ↑ "The Saskatchewan Roughriders' 1956 Season". CFLDB. Archived from the original on August 31, 2013. Retrieved August 31, 2013. ↑ "Former Beaver Quits as Coach". Eugene Register-Guard. Regina, Sask. United Press International. November 3, 1960. p. 3D. Retrieved August 31, 2013. ↑ "Ken Carpenter NFL & AFL Football Statistics". Pro Football Reference. Archived from the original on August 31, 2013. Retrieved August 31, 2013. 1 2 3 "Ken Carpenter". Oldest Living Pro Football Players. Archived from the original on August 31, 2013. Retrieved August 31, 2013. ↑ "Kenneth L Carpenter (1926 – 2011)". Find A Grave. Archived from the original on August 31, 2013. Retrieved August 31, 2013.